Thunder shooting guard Anthony Morrow called it the "ugliest game, offensively, I've ever played in," but it was a thing of beauty on defense. The Thunder held the Rockets to just 69 points (three more than the fewest they'd ever scored in a game and the fewest ever allowed by the Thunder) on a microscopic 28.8 percent shooting overall and 20.0 percent from deep. Trouble was the Rockets were also pretty defensive, holding the Thunder to just 65 points (tying the all-time Thunder/Sonics franchise low and setting a new Thunder record) on 29.4 percent shooting. "It was a very physical game and going in we knew we had to play tough," said Thunder head coach Scott Brooks. "I'm proud of the grit and determination we showed tonight." And the Thunder showed plenty of both. They fought and scrapped and clawed for everything but the shots just wouldn't fall. "You can't control making shots," Morrow said, "but you can control your effort. We showed a lot of toughness." 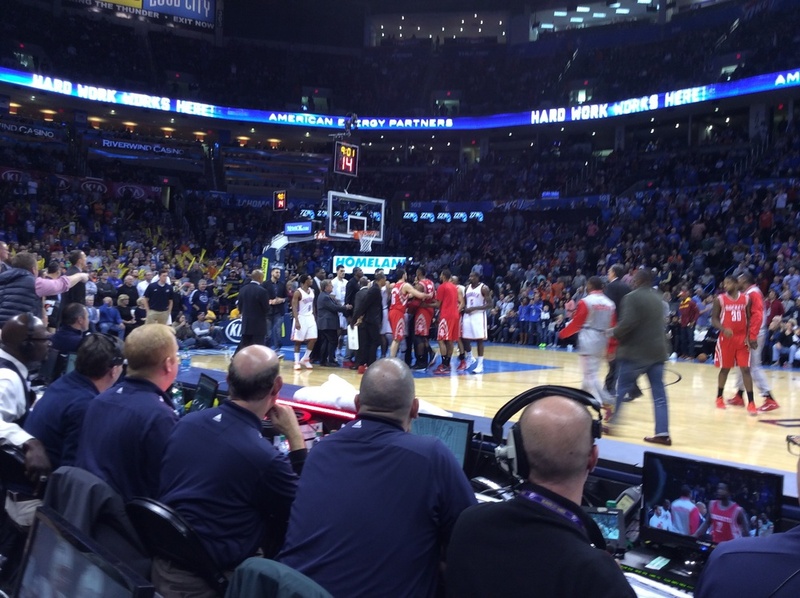 As has become the norm with the Thunder and Rockets things got awfully chippy at times, in fact Brooks even called timeout so he could run out on the court to try to end a confrontation between Patrick Beverley (still OKC's public enemy number one) and lead official Bill Kennedy. Beverley ran right up to Kennedy and got in his face, Brooks ran over to help break that up and make sure none of his players got involved. "I was a little worried for Bill, you never know what can happen," Brooks said. Lance Thomas and Reggie Jackson led the Thunder with 15 points each Jackson also grabbed 11 rebounds but neither shot very we'll. Thomas just 4-for-11 and Jackson 3-for-11. Reggie ended up taking the last meaningful shot for the Thunder, a miss from 28 feet that would have tied the game with 10 seconds to play. The Rockets surprisingly switched center Dwight Howard onto Jackson and instead of driving past him or passing to someone else, Jackson took a couple dribbles and launched. "We should have gotten a better look," Brooks said. Jackson's long shot wasn't the killer though, Brooks said it was more the 22 offensive rebounds the Rockets grabbed than much of anything else, that and the fact OKC's shots wouldn't fall. James Harden led the scoring for Houston, but he had just 19 points on 5-for-17 shooting, Dwight Howard finished with 12 points but he was 4-for-14 from the field and 4-for-13 from the fee throw line. There were a couple of minor victories too, the Thunder got to the free throw line 28 times and hit 22 of those. Remember they were a meager 1-for-6 from the stripe Friday night against Detroit. They also blocked 15 shots (two shy of the Thunder record), Steven Adams had six and Serge Ibaka had five. The bottom line is the bottom line though and despite the superb defense and the grit and the hustle the Thunder lost again and their record slips to 3-8 with a road trip to the mountains up next. They play the Jazz in Salt Lake City Tuesday night and the Nuggets in Denver on Wednesday. The Thunder will just keep chopping wood and hope eventually some of these moral victories will begin to actually show up in the win column.